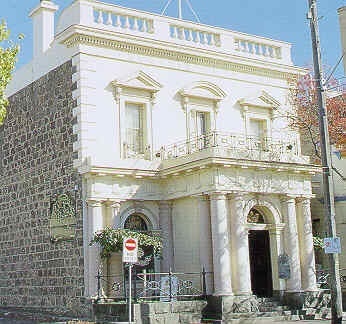 Built for the Colonial Bank of Australasia in 1857, the former Trustees Chambers building is a two storey bluestone structure with rendered front facade, designed by the Geelong architects, Shaw and Dowden. 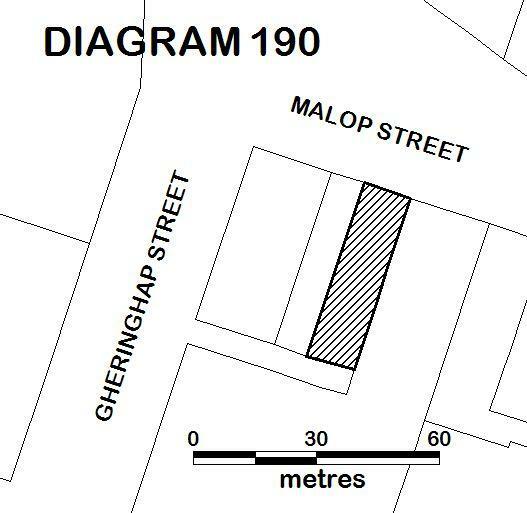 A number of banks were built at the west end of Malop Street at this time as it was assumed that the town of Geelong would develop around the railway station. These include the larger, adjacent Bank of Australasia building of 1859-60 (H0191) and the London Chartered Bank of Australia built opposite in1860 ( H0189). Designed in the Renaissance Revival style, the symmetrical front facade of the former Trustees Chambers building is dominated by a deep entrance portico with balcony above. Pairs of engaged Tuscan columns, with associated frieze of triglyphs and metopes, flank the facade and portico at ground level. Arch headed openings at this level contrast with pedimented rectangular openings above. Quoined corners define the upper facade and the parapet of the building is balustraded. Tenders for additions to the building were called in 1873 by architect J. L. Shaw, and again in 1886, by architect Joseph Watts. The former Trustees Chambers, Geelong are of architectural and historical significance to the State of Victoria. The Former Trustees Chambers, Geelong are of architectural significance as an early surviving bank building in Victoria and as a principal work of architects, Shaw and Dowden. Together with other surviving bank buildings, the Former Trustees building forms an important precinct, illustrative of the initial intended use of this part of Malop Street. 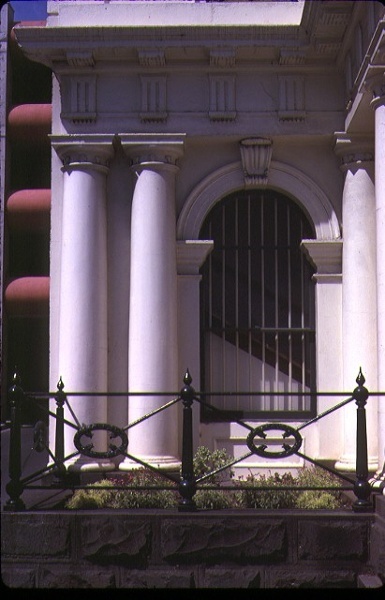 The Former Trustees Chambers, Geelong are of historical significance as an early surviving bank building in Victoria which was constructed at a time of great prosperity in Geelong. It is also of historical significance for its associations with the development of the State as a result of the gold rushes and the wool boom. All of the place shown hatched on Diagram 190 encompassing all of Lot 1 on Title Plan 218532. 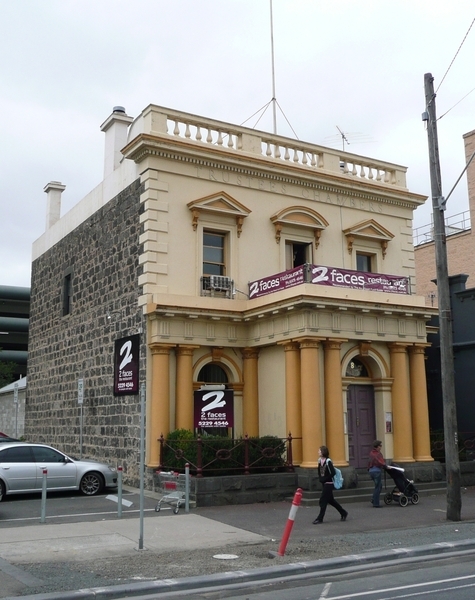 Built for the Colonial Bank of Australasia in 1857, the former Trustees Chambers building is a two storey bluestone structure with rendered front facade, designed by the architects, Shaw and Dowden. A number of banks were built at the west end of Malop Street at this time as it was assumed that the town of Geelong would develop around the railway station. These include the larger, adjacent Bank of Australasia building of 1859-60 (H0191) and the London Chartered Bank of Australia built opposite in1860 ( H0189).